Star Brand Beef is 100% grass-fed, grass-finished beef raised with love in Wyoming. and to provide our animals with lives free from stress and cruelty. All beef starts out grass-fed. If beef is labeled ‘grass fed,’ it is true, but unless it is labeled ‘grass-finished,’ it was also fed grain, usually corn or soy. When cattle eat a 100% grass diet, as they are meant to, this is called grass-finished. The meat is leaner and more flavorful, and the fat is the good kind: high in omega 3s, including EPA and DHA. Grass-finished beef is much healthier for the cattle, for the customer, and for the environment. Grass finished beef from animals that are protected from stress is extremely tender. I take that one step further and have my processor dry age the meat for two full weeks before it is cut and packaged. Taking this extra step results in beef that is exceptionally tender and flavorful. We buy grass hay from farmers who use composted manure to fertilize their fields instead of chemical fertilizers, and lease thousand-acre parcels of pasture land which has never been tainted by herbicides, pesticides, or synthetic fertilizers. Year-round, our cattle drink pure, fresh water from artesian wells and natural springs. We keep our mother cows for their entire lives, caring for them as they reach old age rather than selling them into The System when they stop having calves. Our herd is one giant family unit. We let our cows set the pace when we trail from pasture to pasture, so that they are calm and comfortable. We never use hot shots (electric cattle prods) or whips, and always employ low-stress handling techniques when working with our cattle and while weaning our calves. 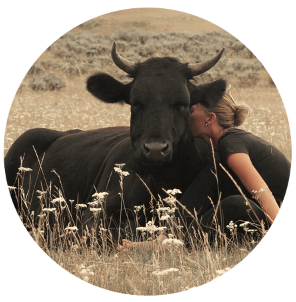 Our cattle are calm and gentle around us because we are calm and gentle around them. My cattle have never been fed corn, soy, sugar beet by-products, pellets, or any GMOs. Thanks to our free-range, low-stress methods and practices, these animals have been free from illness and have never been treated with antibiotics. Star Brand Beef is packaged in individual portions and cuts. The beef is first wrapped in high quality plastic wrap and then in high quality butcher paper – this combo gives it excellent protection for long term freezer storage, superior, in my experience, to vacuum sealing. Even if stored for a full year, your beef will remain untouched by freezer burn or compromise of any sort.